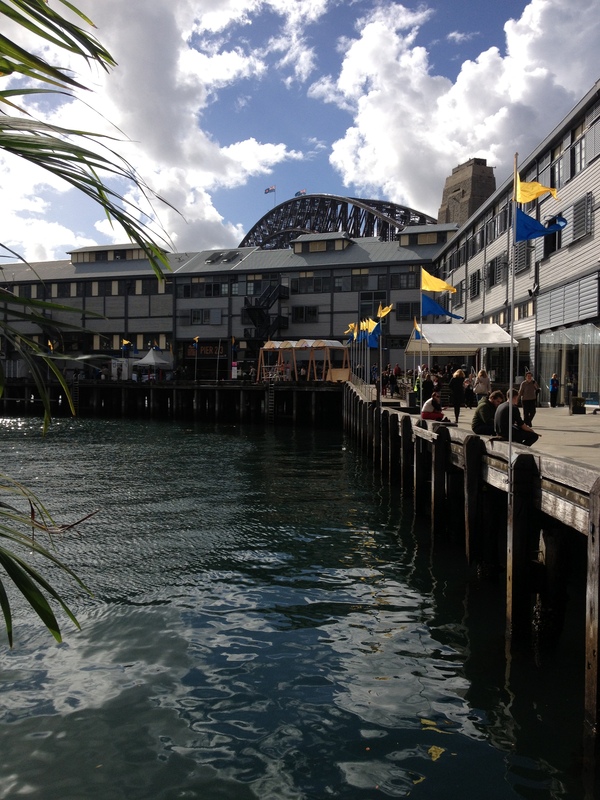 A few days ago I returned from the Sydney Writers’ Festival – the first I have attended, and hopefully not the last. I decided to go to Sydney a couple of months ago when I was moaning to a colleague about how I wished I could go, and when I thought about it later, I realised there was nothing stopping me – I had the leave, and it would give me a great opportunity not only to catch up with my friend Dawn Barker, one of the authors in the festival, but also to meet with my agent, with whom I had only communicated via email. This was the first time I’ve travelled on my own and the first time I’ve been away from my son for more than a working day, so to say it was exhilarating is an understatement. I got into Sydney on Wednesday afternoon and met up with Dawn for a walk around the harbour in the relentless rain and a glass of pinot in a harbourside bar. I met Dawn back in 2010 when we were on the Hachette Manuscript Development Program together. We’ve kept in touch over email ever since and it was great to catch up again and chat endlessly about books and writing and publishing. The following morning I headed down to the festival and saw a panel session on writing about pregnancy and motherhood with Monica Dux and Anna Goldsworthy. It was interesting to hear the authors discussing their experiences with writing pregnancy/motherhood memoirs, particularly when Anna Goldsworthy described how some people had responded with ‘oh, another motherhood memoir’, as if it is somehow a less respectable and acceptable topic than anything else. I like the way these two authors have challenged the traditional touchy-feely stereotypes of motherhood and focused not only on the joys of having children but also the downright shittiness that mothers (and parents in general) can go through on the journey. Humour was also a key element, with Monica Dux’s book including a whole chapter on her fear of ‘doing a poo during labour’, something that’s not generally discussed in polite company but which I can guarantee that every pregnant woman thinks about. After this session I planned to see Michelle de Kretser, who was shortlisted for this year’s Stella Prize, and quickly learnt that if you don’t line up early, you miss out. I joined the line just in time to hear that the session was full. Thankfully I had brought along my trusty laptop, so I managed to find a seat in the crowded festival cafe to have a coffee and do some writing before catching up with Dawn for a quick lunch. Later that afternoon I went to a session on writing painful experiences, one that is relevant to me as my current work in progress has a focus on pregnancy loss. The panel consisted of Dawn talking about her book Fractured, which focuses on postnatal depression and psychosis, Anne Deveson, who wrote a memoir on her son, who had schizophrenia and sadly died several years ago, and Helen Sage, whose memoir describes her experience in caring for her daughter following a near-fatal accident. This was an emotional session as these writers spoke about their experiences in writing about such painful issues. There were many tears in the audience. After this I met up with Dawn and we had a drink before attending the launch of ‘Me and Rory McBeath’ by Richard Beasley. Ah, the benefits of hanging out with a writer! The book sounded amazing and has now been added to my ever-growing pile of To Be Read. Dawn and I then spent the evening at the Festival Club, where Julian Morrow and Chris Taylor from the Chaser interviewed a few different authors. This was followed by an amazing reading by Courtney Collins from her Stella Prize shortlisted novel The Burial. Her reading was accompanied by music and images that made the whole experience hypnotic and brought a new element to the words from her beautiful book. There was also a great performance by Kate Miller-Heidke. By this point I had consumed rather more wine and rather less food than I am accustomed to and had already been up several hours past my usual bedtime, so we retired for the evening. It was an early (and rather groggy) start on Friday morning, as I was meeting my agent, Sophie, at 8.30 at the festival hotel. I was ridiculously nervous about this, which was completely unnecessary as Sophie was lovely. It was great to finally meet her after only being in contact via email for the last year, with the added benefit that I met so many different authors and publishing types while we were chatting. I came away from the meeting feeling positive about my writing and eager to find my own place in the industry. A beautiful place to sit and write. After the meeting I went down to the festival again, but the combination of my mild hangover and the appearance of the sun at last killed my motivation to go to more sessions, so I found a table and chair on the wharf and daydreamed and wrote some more. It was a beautiful final morning in Sydney. In a few hours it was all over and I was on my way to the airport again. Part of me was relieved to be going home, but at the same time I already missed the atmosphere and the sheer indulgence of being around other writers and readers. Festivals like this always inspire me and remind me that this is what I want to do. It makes it easier to return to the computer day after day, bang out more words and build a story that other people will hopefully want to read. I’ve been home for a few days and while I haven’t had much chance to write since, I keep getting flashes of perfectly-formed prose popping into my head. This rarely happens to me. Ideas usually come to me in images that I struggle for days (weeks, even) to properly articulate. So I’ve been making sure I write down these words before they disappear forever, and they’ve really inspired me to push on with my current book so I can use them! It was lovely to get home and see my beautiful family again, and have my son give me a hug and say ‘Yay!’ But I can already feel the festival receding in my mind. It’s back to reality again, but I’m trying to hold the image of Sydney Writers’ Festival in my head for as long as possible, as a motivation to just keep writing, writing, writing.